For over 50 years, MOSA has been supplying the market with reliable high performance products. Expertise and innovation rank MOSA as a global benchmark in the production of machines that accommodate the needs of the electricity production and welding sectors: generating sets, engine driven welder and lighting towers. This exclusive know-how has led to the creation of solutions designed and built according to strict quality criteria that have earmarked the success of MOSA amidst the most demanding end users. 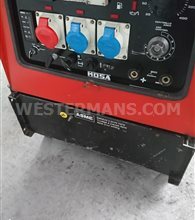 Mosa are manufacturers of Welder Generators and Engine Driven Welders and Lighting Towers for Site work. MOSA is part of the industrial division of the BCS Group, a leading multinational in the agricultural machinery and garden machinery sector.